Abstract: The purpose of the study was to evaluate a trapping design made out of PVC pipes to capture gray tree frogs (Hyla versicolor), and a secondary objective was to evaluate a harness design for hyla tree frogs. PVC pipes were set up 30 feet into trees to be used by the frogs as an alternative resting cavity. 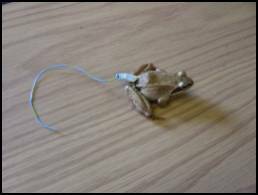 A fake transmitter was used to test a harness design on wood frogs before handling gray tree frogs. Zero traps were occupied by frogs through 20 March- 1 May 2004 and the harness design was not securely attached on the wood frog for at least a week. Extension of field work is needed to evaluate trapping frequency during days when tree frogs are more abundant. Hylid tree frogs are difficult to inventory when using equipment such as drift fences and pitfall traps because they can climb over and out of these trapping devices due to their sticky toe pads (Jones 1986, Dodd 1991). Several researchers have had success monitoring tree frogs using nest boxes throughout the year (McCombs and Noble 1981). During the non-breeding season, McCombs and Noble (1981) concluded that gray tree frogs (Hyla versicolor) used artificial nest boxes more frequently than natural cavities. Moulton et al. (1996) and Boughton et al. (2000) successfully used PVC pipes as an artificial cavity to inventory green tree frogs. During the fall of 2003, I captured one gray tree frog with a PVC pipe that was hanging from a tree. After alterations of the pipe design and trap locations, 13 PVC pipes were set out to capture gray tree frogs during the spring of 2004. My goal is to indicate whether if these frogs use PVC pipes as a retreat during the spring season. A secondary objective is to evaluate a radio transmitter harness design. No research had been studied upon radio tagging frogs that are less than 5 grams. Therefore, once a gray tree frog has been captured, a transmitter will be attached to the frog by attaching a harness around its waist. My goal is to evaluate the transmitter harness design by monitoring its movements using telemetry. The study was conducted at a wooded wetland owned by Walter Braun and managed by Bernie Braun. The elevation of this area was approximately 1,680 ft. and in the township of Seward, New York. The 2.4 ac. wetland was located at 42¡ 40Õ 24Ó N and 74¡ 37Õ 49Ó W. The dominant overstory species along the wetland was the eastern hemlock (Tsuga canadensis). A few red maple (Acer rubrum) trees were on the edge of the wetland and some red oak (Quercus rubra) trees were located next to the hemlocks. Arrowwood (Viburnum dentatum) was the dominant mid-story species which was growing on the edge of the wetland. There were very few understory species growing under the hemlocks. The surrounding topography was mostly flat. During the spring and summer of 2003, local residents heard numerous gray tree frog calls at this particular wetland. Therefore, this wetland was an acceptable area to monitor gray tree frogs. Thirteen traps were constructed out of 1.5 in. internal diameter PVC pipes and were capped from the bottom. Traps were cut 2 ft. in length, and drain holes were drilled 10 in. from the bottom. Two holes were also drilled 2 in. from the top for attaching a string to the pipe so the trap could be hung. Six inches of water were in each trap to attract insects for the tree frogs to prey on. The traps were hung on trees that were 25 to 30 feet from the ground. Crew members, as well as myself, climbed up stable tree branches to hang the traps on to the trees branches. Authentic parachute rope was used to work as a pulley system so the traps could be easily accessed (Fig. 1.). The sampling of gray tree frogs was carried out from 20 March- 1 May 2004. Sampling was conducted twice a week on non-consecutive days between 1200-1600 hours. Only a small number of trap nights were scheduled so that the tree frogs would be lured into the trap with minimal disturbances. The traps were placed on random trees on the wetland. Traps were placed on 3 red maple trees, and 10 eastern hemlock trees. Once a frog has been found within the pipe, a small plastic bag was put over the open end of the trap. The frog was then dropped into the bag to identify its species. Once identified, the frog was then placed back inside the trap. Data of the location, weather condition, date and tree species were then recorded to identify the frequency of occurrence in the PVC pipes. Fig. 1. Pulley system design on a tree branch. The harness design was approximately 20 mm in length and was tested on wood frogs (Rana sylvatica) before handling any gray tree frogs. This small pilot study was to understand what the process will be like in terms of handling frogs as well the placement of the transmitter. Two wood frogs were used in the experiment in which one was a control while the other was the experimental frog. The harness design consisted of a flexible string that threaded through 1 mm sized beads. It was then glued to a fake transmitter that weighed approximately 2.5 grams. It was made out of wires that resembled a real transmitter. The transmitter harness was then dressed on the waist area of the experimental frog (Fig. 2.). Careful observation of the frog would then follow for at least a week. Observations would include if the correct position of the radio-tag would be stable, occurrence of abrasions on the waist of the frog, and if the radio-tag would limit the frogÕs capabilities of movements and feeding. Fig. 2. Wood Frog harnessed with a fake transmitter during prototype trials. After proceeding with the experiment, within 18 trapping checks, 0 frogs were caught during the beginning of the spring season. Environmental factors such as temperature and humidity were sub-optimal in the early spring. As May arrived, gray tree frog calls increased while optimal temperatures were suitable for breeding. After experimenting with the harness prototype trails, the harness design failed to fit the frog for at least one week. The frog escaped the fitted harness within an hour. Work in both trapping frogs and fitting designs are in current process to meet goals and objectives. Capturing gray tree frogs between late March through May 1st was a failure. Field works needs to extend throughout the spring and into the summer to obtain an accurate evaluation of the trapping efficiency. Alterations of the trap locations might be considered for next year. Instead of placing traps outside of the wetland, a suitable area would be in the wetland. Gray tree frogs are abundant during the breeding season and breeding usually occurs in the wetland (Harding 1997). Therefore placement of traps in the wetland can provide as a retreat for the frogs during the day time. Fitting the harness on the frog was extremely difficult. We imitated the same procedure as Muths (2003) did in which two people were needed in the process of fitting the harness. One person would hold the frog while the other person would loop the harness onto the frog. This method stressed the frog out enormously because it continuously urinated (defense mechanism). A suitable method would be to slowly chill the frog down so its metabolic rate would decrease, therefore sustaining an unconscious state. This way, the frog would not be stressed out as much, and the harness can easily be slipped onto the frogÕs waist. Despite the lack of field work, experience in handling frogs and successfully creating a pulley system for PVC trapping has been accomplished. More field work is needed to meet key objectives for this study. K. E Tregger helped with the construction of the PVC pipes. B. Braun and W. Braun allowed access of their land for this study. S. Samolis provided equipment to set up the traps. K. L. Berner and M. P. Losito gave important advice throughout the study. J. Miles, A. Giardinelli, L. Carson, and E. Duke helped set up the traps. BOUGHTON, R. G., J. STAIGER, AND R. FRANZ. 2000. Use of PVC pipe refugia as a sampling technique for hylid treefrogs. The American Midland Naturalist 144:168-177. DODD, C. K. JR. 1991. Drift fence associated sampling bias of amphibians at a Florida sandhill temporary pond. Journal of Herpetology 25:296-301. HARDING, J. H. 2004. Amphibians and reptiles of the Great Lakes region. The University of Michigan Press. Ann Arbor, Michigan, USA. JONES, K. B. 1986. Amphibians and reptiles. Pages 267-290 in A. Y. Cooperrider, R. J. Boyd, and H. R. Stuart, (eds. ), Inventory and monitoring of wildlife habitats. U.S. Department of Interior, Bureau Land Management Service Center, Denver, Colorado, USA. MCCOMB, W. C., AND R. E. NOBLE. 1981. Herpetofaunal use of natural tree cavities and nest boxes. Wildlife Society Bulletin 9:261-267. MOULTON, C. A., W. J. FLEMING, AND B. R. NERNEY. 1996. The use of PVC pipes to capture hylid frogs. Herpetological Review 27:186-187. MUTHS, E. 2003. A radio transmitter belt for small ranid frogs. Herpetological Review. 34:345-348.